Washington D.C., USA – 30/01/2015 – as published by BBC Trending. A French government infographic designed to help fight jihadist ideology gets widely shared online – but with a heavy dose of sarcasm. But it didn’t take long for sarcasm to emerge. And it was the government’s infographic about radicalisation that seemed to catch the internet’s attention most of all. It spells out eight “tell-tale signs” of radicalization for people to watch out for in others, such as withdrawing from friends and family, quitting sporting activity, terminating old friendships and changing the way you dress. “In fact, the campaign to #StopDjihadism isn’t about identifying potential jihadists, it’s about describing unemployed people,” was one of the most widely retweeted quips. 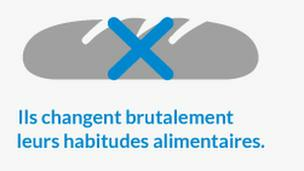 The most cutting remarks were about the warning that those who change their eating habits – indicated in the infographic by a cross over a baguette-shaped object – are likely to become extremists. “The government invites you to be wary of those who do not eat baguettes,” said one user, in a theme that was echoed by many others. Jonathan Russell, Political Liaison Officer at the London-based counter-extremism Quilliam Foundation, told BBC Trending that sarcasm is to be expected when it comes to government-run campaigns. “The general response is that people don’t like to be told how to think,” he said. “This doesn’t mean that those doing the mocking are supportive of extremism. It’s more that because it is a centrally run campaign it lacks an element of credibility”. What about the Muslim response online? At around the same time as the government campaign was gaining popularity, another tag, #Ahmed8ans (“Ahmed aged 8”). It refers to the “arrest” of an eight-year old boy who, according to press reports, was summoned before police in Nice on Wednesday. BBC Trending has contacted his lawyer who spelled out his version of events. He said the child was asked by his teacher if he “was Charlie.” He is of Muslim background and 8 years old. He said he was against Charlie Hebdo’s cartoons of the Prophet and told his teachers that he was with the terrorists. He was sent to the school director, who according to the lawyer’s account asked the child three times in front of the class, “are you Charlie?” A police complaint was filed against the child, according to the lawyer. There was criticism and outcry online by those using the #Ahmed8ans tag, and it ended up with slightly more tweets than the #StopDJihadisme tag.